L-Shaped Computer Desk PC Table Home Office Corner Corner Desk is made of MDF and Metal. If you are in the need for a functional solution for your office area then our L-shaped Desk is the right choice for you. This chic corner desk effortlessly fuses streamlined, clean lines with open, multifunctional space. Designed in an L shape, this desk adds extra workspace to any home or office without crowding up a room. Perfect for gamers, office workers, designers, and even students, this desk will help you setand accomplishyour goals. L-shaped Computer Desk is made out of a beautiful MDF that appearance and functionality are classy and efficient in home/office. L-shaped Design, wide desktop and space saving, you will have plenty of surface space for writing, computer work and other home office activities. 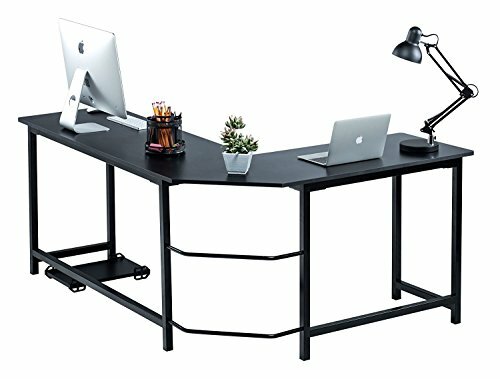 L-Shaped desk size is 49.2''+66.1''(L) * 18.9''(W) * 29.1''(H); computer desk weights about 60 lbs, max weight capacity for top of desk: 600 lbs. L-Shaped desk contains a free base unit stand and a free Desktop Storage shelf, includes necessary tools and instructions to assemble the computer desk. We fully guarantee your benefit if item damaged on arrival, please feel free to contact us to Issue a full refund or process a replacement. No return requirement just send us the picture about the broken part. If you have any questions about this product by GS, contact us by completing and submitting the form below. If you are looking for a specif part number, please include it with your message.